In a large bowl, use your hand to really mash and squeeze all the stuffing ingredients together. You’ll know you’ve mashed it well enough when the stuffing mixture is all sticky and you can’t get it off your hands and fingers. This is my favourite video, make sure you read the comments people have posted. I think they’re hilarious because it seems to be all women fantasising about this man and his hands, really quite funny! You’ll need roughly one generous teaspoon of stuffing mixture for every gyoza. After you’ve made them, chill your gyozas in the fridge for ideally an hour at least. Using a brush or a paper towel, use one teaspoon of oil to coat a non-stick fry pan. 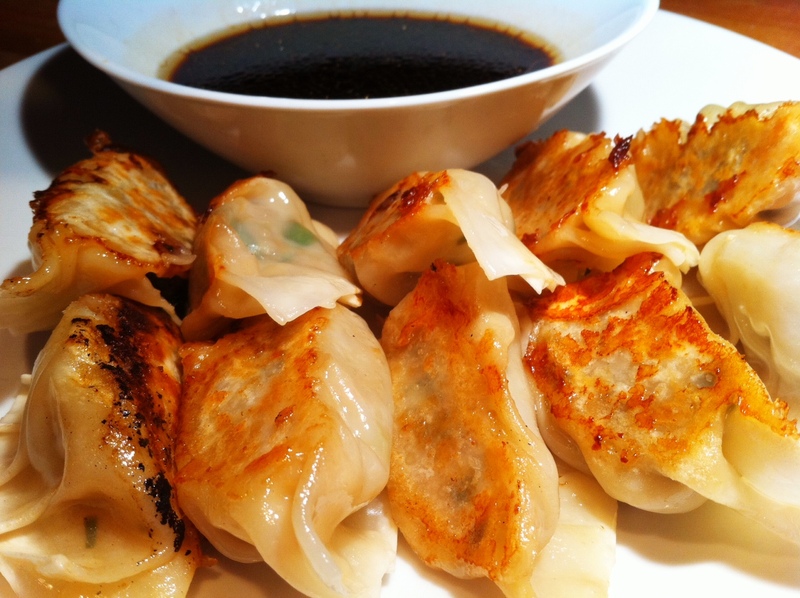 Heat your fry pan and place your gyoza in the pan to fry. Fry them for about 1 minute. Pour water over your gyoza (no more than halfway up the gyoza), put the lid on your fry pan and let your gyozas cook for 5-6 minutes. The water should be almost all evaporated. Pour 1 teaspoon of oil over the gyoza and let them fry for another minute or so. Serve them flipped over to show the fried side up, then dip, dunk and devour!